It’s almost been 2 weeks since we had a sunny morning. We’ve also had 3 or 4 spring storms roll through with some pretty large amounts of rain. Yesterday was a pretty day. 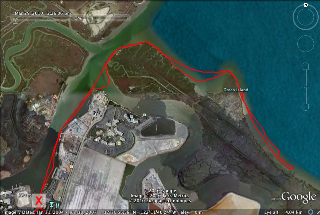 I set out early from Redwood City Marina because I wanted to explore south out of the main channel towards Dumbarton Bridge, and winds were expected at 15k. The tide was on ebb after 10 AM, so I was going to take advantage on my way back. Sorry no pictures today. I do have a map of my route though. Lots of people out. I saw only one other kayaker putting in as I was getting out. No one was around me in the bay except for about 15 seals as I rounded Greco Island taking advantage of the sun and bathing in it’s warmth as I passed by. Saw a few young pups too. All in all a nice outing of about 13km. Still trying to get my systems down. Set my watch to drink at 15 hours instead of minutes today; oh well. And my Forerunner’s batteries died instantaneously. Not sure how that happened as I charged it all night long? eat well, sleep well………….paddle fast! This entry was posted on April 25, 2010 by DummyDiva. It was filed under Uncategorized and was tagged with kayaking, outdoors, paddling, Redwood City, training.